Delivery estimate: 1-2 weeks delivery, usually 2 maximum. Shipped by US Post Office Priority Mail with tracking number www.usps.com and it will require your signature upon delivery. How come the "live Video" does not seem that it is live? If the image appears to not be changing, there could be no movement. If you expect movement and nothing appears to be moving, look just above the image for the words AutoRefresh OFF. If it says AutoRefresh OFF then all you have to do is move your mouse to the gray area to the right side of the picture (you might have to click on the empty gray area. Once you move your mouse (or click if needed) the words above the picture should change to AutoRefresh ON, once it does the image is live. AutoRefresh ON = image is changing automatically. AutoRefresh OFF = image is not changing automatically, move mouse to gray area on the right side. How come the video seems to only change once every 1 or 2 seconds? The default setting is at that speed. The person running the PC and the camera system can change an option to up to 30 frames per second. Going that fast requires a fast internet connection, fast PC too. Is Remote Control Base a device or is it just software to control a webcam? BOTH. The Remote Control Base is the name of our base and the software for controlling it. The Remote Control Base is a motorized mount for your webcam or digital camcorder. You can move your webcam from another computer if they are both on the Internet or on a LAN. You will need to buy a Remote Control Base and install Remote Control Base Software, which we include with the Remote Control Base, and it is also provide as a free download from our website. Note: without the Remote Control Base, your webcam will not be able to move. You may purchase a Remote Control Base here. I have a remote webcam and I would like to be able to move it from another computer. Is it possible? Yes, it is real easy to move it from computer to another one. Once you install the software on each computer, then it is just plug-and-play. How many USB ports do I need? Normally you need two. One for the webcam and one for the remote control base. If you use a USB extender or USB Hub then you only need one on your computer. Can I use the Remote Control Base without a computer? How far away can my Remote Control Base be from my computer? 4 feet up to 500 feet with USB extenders. 4 feet normal easy hookup using the original USB cables. Here is a more detailed explanation and a second method to solve a low power issue: The remote control base is powered by your computer's USB port. All USB protocols are supposed to be to a set standard of specifications. However, since different computer manufactures use different power supplies, specifications sometimes vary. You may be seeing the message above, for one of two reasons; either your computer's power supply is smaller than most, as in some laptops, or you may be using a longer USB cable than the one that we supplied, thus reducing the current delivered to your computer. You can solve this by either following the link to purchase an external power supply, from us, or by following the following method. If your remote control base is having a low power issue, it should, automatically, give you a purchase link, from your computer your remote control base. If you are having a power issue, because you are using a longer USB extension cable, our powered cables are only 6 feet long. IN SOME CASES using a long extension USB cable will reduce the amount of available power, due to increased electrical resistance, in the USB wire. To solve this issue, you can use the following method: If you are using an extension USB; the electrical current:, supplied through a longer USB cable, tends to drop off over distances more than 6 to 10 feet. To solve this, you can add a POWERED USB HUB, to supply additional power, on the remote control base end of the extended USB cable. In order to use your remote control base 25 feet from your computer: Use a 20 foot USB cable, from the computer, to the Powered HUB. Then use the 6 foot cable that we supplied with the remote control base, to connect the HUB to the remote control base. Look for a powered hub that has a at least 2.5 amp power supply and place it in the line on the remote control base end of your USB extension cable, then connect your remote control base. Please make sure that you are using, at least a 2.5 amp powered HUB. A lower powered HUB will fail. Look for a powered Hub that has seven or eight USB ports. These hubs tend to have more robust power supplies even though you might not need all the ports. Used if your laptop's USB port or your USB extender does not generate enough power. How big is the Remote Control Base? The Remote Control Base is 5" in diameter and 4" high without the camera. With the Logitech QuickCam Pro 4000, it is 6" high. If you are going to enclose it within a dome, allow one more inch for movement of cables. I'm wondering how noisy the Remote Control Base is. How loud is the motor noise it makes? The Remote Control Base is controlled by servo motors so it does make noise as it pans and tilts. The noise is not very loud, though it is definitely noticeable in a quite room. Is the Remote Control Base weatherproof to any extent? The Remote Control Base itself is not weather proof, although some customers have mounted them in (7 inch diameter) outdoor domes. Click here for our domes. Click here to view and control a Remote Control Base that is mounted outdoors. BUT our system does not require heater or blower if installed outside, just put it under a plastic dome to protect it from rain and snow. More expensive systems sold by others require heater/blower's. Is the Remote Control Base wall-mountable or ceiling mountable? The Remote Control Base is wall or ceiling mountable. The retail version comes with a tripod mounting bracket. A standard 1/4" diameter #20 screw can be used to mount it. Will the Remote Control Base function properly in Australia? We have 240 volts power supply here. The Remote Control Base works fine anywhere in the world. Your computer converts the power to 5 volts for USB. It is an international standard. Will the Remote Control Base work with a bus-powered USB hub? Some do and some do not. The Remote Control Base requires 500mA of current. Some hubs and computers may report over-current as this limit is approached. Remote Control Base Software 3.4 or higher will detect this situation if it occurs, and will give you the option of ordering an external power supply from our website. What we've found is if the USB hub has a 2.4A power supply then it usually (but not always) has enough juice because the hub's own circuitry takes some current, so if it's only 2.0A or 2.1A, then it doesn't really provide 500mA to each port. The brand "D-Link DSB-H4" is known to have a 2.4A power supply and this is the one we recommend. Just make sure the hub is in self-powered mode and not bus powered. Live Training done with you on the telephone with us while we connect to your pc remotely. We would ask that you install the following software GoToMyPC and once it is installed you would use that software to "invite a guest" to your pc. The guest would be me. I would then be allowed with your permission to move your mouse on your own computer showing you the features and options while we are talking on the telephone. Cost of this is $50 for up to an hour. STEPS you need to take: Pay for the training session using the buy now button below, install the software GoToMyPC, set up an appointment time with us ahead of time, call us at that appointment time (1-651-321-3131). We will then be able to connect to your pc from our office talking you through some of the features and options. We would like to connect several cameras to one server. Is this possible with your system? Yes, our Multi-Cam Surveillance Software will allow you to connect several cameras to one computer. For more information, Click Here. If running our remote control base with its Logitech QuickCam Pro 4000 it should work if your computer is running Windows XP. But you need the latest drivers from Logitech. Also in our Multi-Cam/CamPanel each Logitech has the same name. You will need to plug in the first camera, Add a Camera in Multi-Cam/CamPanel, use that camera, then plug in a second camera, click Add Camera in Multi-Cam/CamPanel, use the new one, etc. Otherwise you can't distinguish one from the other. IMPORTANT: While our software supports just about any single camera connected by USB, Firewire, or a capture card, special features are required for duplicate cameras to work together on one computer. Multiple ADS USB2 Webcams and multiple Watchport/V Webcams do work on the same computer with our multi-cam software. Webmasters: Can I put multiple webcams on one of my websites webpages? Yes, you can. I have a webpage here that has two different webcams on one page. I will not guarantee both of these webcams are up and running when you view this, but if you view the source code for this webpage you will see two Java Scripts (one for each webcam). b. TO get your IP Address to put a clickable link in a webpage or email: after you do step 4a, there is a drop down list towards the bottom that says something like "URL for remote control and viewing". Select the 2nd entry in the drop down list (the one under the words IP NUMBER) and you will see the full IP address line. type in your keyword in the search box, and your camera should be listed. Remote control system for webcams: Any Windows PC that supports USB ports. Windows 98 2nd edition and above which includes Windows Millennium, and XP. Windows NT, Windows 3.1 or earlier do not support USB ports. Needs 2 USB ports. 1 for the camera and 1 for the remote control base. Needs only 1 USB port if you use our USB extension kit. Windows compatible sound card and also microphone if you want to hear and talk. If you don't need to hear and talk, then no sound card or speakers needed. How do I list my webcam on the 321cam website like the others? How come I can not move and/or see my own webcam via the internet? Most likely you have a network and/or router. Most DSL, Cable and corporate internet connections use a network and/or router. The problem could be because you trying to connect to your webcam via the internet while you are on the same network and/or pc. If you went to another pc - outside of your network and tried it, it should then work. Or call a friend and have them try it. How can I test that the Remote Control Base will work with my camera before I buy it? You can download and install the Remote Control Base software free from our download page. If you see a white box in the Remote Control Base console that follows you as you move, then your camera is compatible with the Remote Control Base. Do you support the Creative Webcam III? Yes, we support the Creative Webcam III. 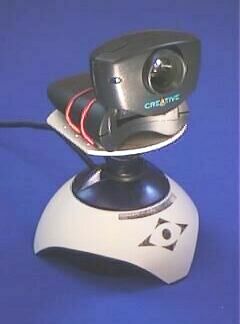 Click Here to see a photo of a Creative Webcam III on a Remote Control Base. I have a Philips webcam and I'm wondering if your Remote Control Base will fit this camera. Yes, our Remote Control Base does work with the Philips 720k & 740k. 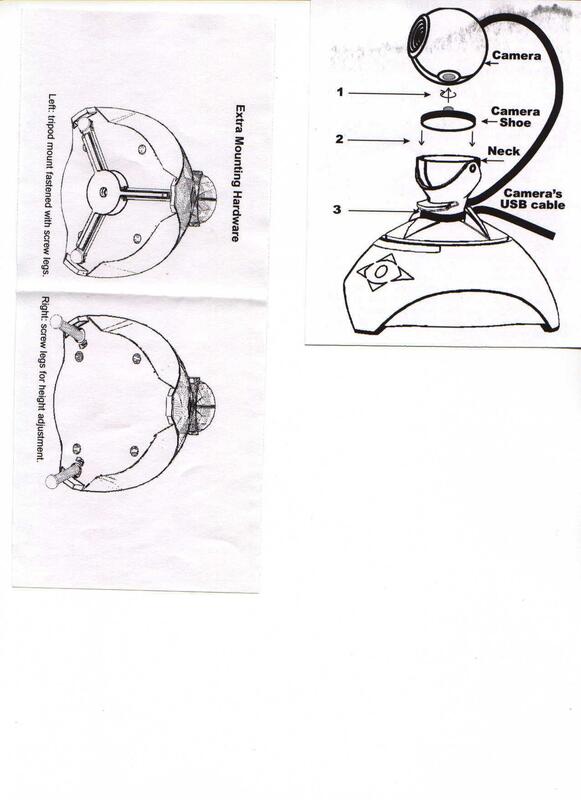 However you may have to adjust the home position manually because the TOUcam tilts forward by its own design. Click Here to see how the TOUcam fits the Remote Control Base. Do you support the 3Com HomeConnect webcam? The weight is under a pound, but it's not a spherical shaped cam. Yes your camera can be attached to a Remote Control Base. Do you support the Orange micro Ibot Pro w/ firewire or the Ibot2 with USB 2.0? We tried IBots with our Remote Control Base software, and they work perfectly. However, it was not easy to mount the Ibot Pro onto the Remote Control Base. We had to cut out the center piece of the camera shoe, then glue the iBot onto the camera shoe. The Ibot2 does come with a tripod mount that fits our camera shoe. What are the specs of the camera that you recommend? The camera we optionally bundle with the Remote Control Base is the Logitech QuickCam Pro 4000. It has a maximum resolution of 640x480 and operates at up to 30 frames per second. For automatic tracking to work properly, it must be possible to turn off automatic gain and white balance. I don't care about tracking people - I just want to remote control my webcam. Do I need the Logitech QuickCam Pro camera? We recommend and guarantee that the Logitech QuickCam Pro 4000 will work with good tracking performance. However, if you simply want to be able to pan, tilt, and zoom your webcam over the internet, you can use a less expensive webcam. Can I use a parallel port camera, such as the Quickcam VC, with the Remote Control Base system? We have tested parallel port cameras with Remote Control Base. They work if they have a VFW or WDM driver, which the QuickCam VC does. In any case, you can test your camera by downloading and installing our software from our download area. Can I start and stop my video, remote control base, camera, recording etc... remotely? Does Remote Control Base work on Linux? We have not yet found a way to fully support Remote Control Base's features on Linux. However, thanks to Dr. Derrick Parkhurst from Johns Hopkins University, you can get open source Linux drivers that support many of Remote Control Base's features. Will there be a MAC version coming out? We considered Mac support prior to OSX but decided we could not justify the cost. We will look in to whether it's easier now under OSX. Are there any plans to introduce support for Windows NT? Windows NT does not support USB. There are Windows NT webcams that use the parallel port or interface cards, but our Remote Control Base needs USB support. Windows 2000 and XP are fully supported. Do you support Windows XP? Yes, Remote Control Base versions 2.2 and higher support Windows XP. With Windows XP, what should I do if I am having issues with Java? Currently Microsoft has removed the download for the Microsoft Virtual Machine off their site, however it is still possible for you to download it off other sources. We recommend that you use the Virtual Machine if you are encountering issues with Java in Windows XP. Click Here to find sources for the MS Virtual Machine. I'm wondering if the Remote Control Base software interferes with existing software. Let's say I want this camera to follow movements. Is it still possible to keep my software that today is "Supervision Cam" simultaneously with Remote Control Base to keep track of movements ? Our software doesn't prevent you from using your current software. Remote Control Base makes a copy of the video stream for other applications. You need to start Remote Control Base Software and then select "Remote Control Base Capture" or "Microsoft WDM Image Capture" as the video source in your webcam software. Can I use the Remote Control Base with 321Cam, Paltalk, Webcamnow, Netmeeting, Camarades Webcam, Webcam32, iVista, iVisit, EyeballChat, Webex, EarthCam TV, or Instant Messenger, Windows Media Encoder? Remote Control Base uses the camera video and feeds a copy to your app. If you need to use the Zoom or person tracking features, then you must use this method: start Remote Control Base Software first and select your camera. Then start your app and "Remote Control Base Capture" or "Microsoft WDM Image Capture" as your video source. Your app uses the camera video and Remote Control Base ignores video. Select NO CAMERA in Remote Control Base Software. Use this method if you want Remote Control Base to pan and tilt your camera only. The cameras & software will work with Windows Media Encoder. Can I use the Remote Control Base with any other webcam software? If you do not need to use the tracking feature, or zoom, then it is possible to use Remote Control Base simply as a camera movement remote control device with any webcam software. The way to do that is to select NO CAMERA in Remote Control Base Software. That way, your own video hardware and software work independently of the Remote Control Base, and the Remote Control Base simply moves your camera around with the arrow buttons or pre-set positions. Do viewers of my webcam have to go through 321Can's website to see it? No, when you start the remote control base software it will give you the option of putting the video on our website, but it also gives you a webpage/ip address that you can use to view your live video without going through our website. You can send that webpage/ip address to someone via email or even put it in your own website. Also there is what the "List Me" option in the "Get Online" dialog. It tells our server to give your current IP number, whatever it is when software starts, to people who try to connect to your unique fixed remote control base URL. That URL is also shown in the Get Online dialog. If you have a website or are sending out email to your friends, just choose " List Me" on TrackerCam Server and use the fixed URL you see in the dialog. If you elect to broadcast to our website you don't have to worry about IP numbers changing because when you start the software you can elect to broadcast to our website as many others do (120-160 at any given time), but you can password protect the video so only you can see it even when its being broadcast to our website. QUESTION 1) My router gets its ip address via dhcp, so it is possible new ip addresses and dns numbers could be used every few days. When I bring up software and use the Get online process and choose the "proxy/web address" and the url is built, would I need to send it out to the viewers each time if it changes? I'm a little vague there. I'm thinking of getting a static ip address from my ISP, I guess this would solve the issue of changing ip addresses. ANSWER 1) This is what the " List Me" option is for in the " Get Online" dialog. It tells our server to give your current IP number, whatever it is when software starts, to people who try to connect to your unique fixed remote control base URL. That URL is also shown in the Get Online dialog. If you have a website or are sending out email to your friends, just choose " List Me" on TrackerCam Server and use the fixed URL you see in the dialog. What if the IP address changes? You don't have to worry about IP numbers changing because when you start the software you can elect to broadcast to our website as many others do (120-160 at any given time), but you can password protect the video so only you can see it even when its being broadcast to our website. You can put multiple webcams onto a single webpage. Click here for an example of two webcams on one webpage. When you start the remote control base software it will give you the option of putting the video on our website, but it also gives you a webpage/ip address that you can use to view your live video without going through our website. You can send that webpage/ip address to someone via email or even put it in your own website. Also, there is a "List Me" option is for in the "Get Online" dialog. It tells our server to give your current IP number, whatever it is when software starts, to people who try to connect to your unique fixed remote control base URL. That URL is also shown in the Get Online dialog. If you have a website or are sending out email to your friends, just choose " List Me" on TrackerCam Server and use the fixed URL you see in the dialog. Do I need to use your servers to view the streaming video from my Remote Control Base or can I use my own IP address and port? Yes, you can specify your own IP number and port. You do not need to go to a public server. We have a 'Get Online' dialog that lets you set those options. Your computer becomes a web server on the selected port. How do I set up a webpage so anyone can move my Remote Control Base? From your Remote Control Base Tool Panel (bottom left arrow), click on the Get Online button (top right) to start Remote Control Base's built-in web server. You can choose to enable all guests or just specific users. For Remote Control Base 3.0 and above, a fixed URL is shown that you can give to others. That URL will work to let people move your Remote Control Base even if your computer's IP number changes. If I set up a webpage so anyone can move my Remote Control Base, what happens when several people want to move the camera at the same time? Is there any priority? The movements are relative, so the different people nudge it collectively to where most of them want to look. We originally had a limit that could be set, but it was simpler not to limit it for private cams. It's pretty easy to realize when someone else is controlling it. We find that when people realize that someone else is connected and moving it, they like to see what the others are interested in. If the camera is not moving and they get bored, then they start clicking again. So far it hasn't been a problem since most of our users run private webcams. If it becomes a problem we can add the time limit back. Do people that want to see the video from my webcam need to download any software to their computer? Can I set up Remote Control Base to work if I only have a dial-up connection to the internet? For dial-up, we recommend you upload pictures by ftp because, usually with dial-up, people don't normally leave their computers connected to the internet 24 hours/day. Remote Control Base can ftp pictures to a web page on the ISP. It can do that at fixed time intervals. It can also detect your current IP number and send that to your ISP in an HTML file so that if you visit your home page when your Remote Control Base is online, you can move it around from your web page. How do I change the refresh rate? When connecting to my Remote Control Base over the web, updates to the screen are very slow. You can set the maximum frame rate for remote users from within the tuner to up to 30 frames per second. The actual frame rate will depend on the speed of the internet connection between your computers. On a 100Mb LAN, we have obtained 15 frames per second at 320x240 resolution. You can also change the video size to be smaller or larger. The small the video size, the better the frame rate is. The max frame rate for remote connections is a Tuner setting. It's there to allow many simultaneous connections and reduce ISP bandwidth costs. You can increase that to whatever the connection will take. A 100Mbit network will do about 15fps, but this depends on the resolution chosen. How do I send images periodically to my webpage using FTP? First of all you only need to use the FTP upload page if you want to periodically update an image on an existing webpage. You don't need FTP upload if you want to web cast live images and provide live pan/tilt/zoom controls. Remote Control Base Software automatically asks you for the information it needs for live web casting. All the webcams on our LiveCams Page are accessed in this way without FTP at all. Assuming you really need FTP uploading to an existing webpage, you need an FTP account with the ISP where that webpage is stored. Your ISP would provide you with a username and password for your FTP account. Enter those in the FTP Uploading Tuner page. Your ISP will also tell you whether your webpage is stored in your FTP home directory or in a subdirectory. Your webpage should have a link to a named jpeg image to display. (Remote Control Base Software will automatically update that image.) If the image will be stored in your home directory, just put / in the remote directory box. Otherwise you will have to enter the subdirectory where the image should be stored. The image filename must be the same as the jpeg image named in your webpage. Enable image upload to make Remote Control Base automatically update the image on your ISP at the set time interval. Finally, you have the choice of uploading the full image captured by your camera, or just the part of full image that is displayed in the Remote Control Base video window. The full image can be as large as 640x480, while the Remote Control Base video window can be as large as 352x288. I am using a router. How do I get through my firewall? This answer assumes you have Remote Control Base Software 3.4 or above. If you have a router like Linksys, Bay Networks, SMC, etc., you need to find out how to redirect port 9201 (or the port number you selected) to the computer with the Remote Control Base. iNetCam has some information on how to do this. Use port 9201 instead of port 80. Once you set that up, start Remote Control Base Software, press the bottom-left arrow to open the Tool Panel. Then press the top-right button in the Tool Panel to Get Online. Press the IP number drop-down list. If your router was properly configured, you should see your router's external IP number in the list of IP numbers in the browser window that comes up. Select your IP number. Note that you can also choose a port other than 9201 but you must restart Remote Control Base Software if you do so. Check the box to put yourself on-line and allow guests if you want to. People from outside your firewall or router should be able to connect to your Remote Control Base using your firewall or router's IP and port number that you selected. Linksys routers work well and they have all the features to allow one or more of our systems to get through the routers firewall. I have set the screen size in the Tuner to 5 (640x480). In the Remote Control Base video window the size is OK, but in the web browser page the window is rather small. I'd like to enlarge it to 640x480. Could you please give me a hint on how to solve this? The web browser page is a Java Applet inside a simple HTML layout page. You cannot adjust the size of the Java Applet. 640x480 resolution produces very slow frame rates over the Internet. However, if you use Remote Control Base Software Buddy List to connect to a remote Control Base, you will be able to get 640x480. This is designed for users on a 100Mbit or faster LAN. Are you planning on adding access/deny list capabilities to your Remote Control Base software? It would be nice to be able to block/prevent some unwanted visitors (ip addresses) from accessing the webcam in guest mode without making it hard for others to login/request used id/password. We haven't had to do this because it's just as easy to disallow guests and send your friends a URL with the login and password encoded. See the Get Online dialog for the URL to automate login. The problem with blocking IPs is that many people don't have fixed IPs so the method is not effective. Do you provide focus control with your zoom function? That is, do you have a Remote Control Base that can focus when you zoom in or out? We provide digital zoom, not mechanical zoom. Unfortunately extra hardware is required for focus. Cameras with pan/tilt/zoom and auto focus are in the $1000 price range. They're typically made by camcorder manufacturers but not by us. Sony and Canon are popular makes for pan/tilt/zoom cameras with auto focus. We are the only company to provide a zoom feature in the $200 price range right now for use with any ordinary webcam. Can sound be transmitted? I have my Remote Control Base linked to my web page so my friends can keep an eye on my business. My cam has a microphone. Can we hear what is going on too? Remote Control Base Software 3.02 or higher can transmit sound as well as video to a computer that is running just a web browser. Click on the microphone button at the bottom right of the video applet. Sound transmission is bi-directional. If the remote computer has Remote Control Base Software 3.02 or higher, you can use the Buddy List on the remote end to hear the audio (also bi-directional). You need to Enable Talk in Remote Control Base Software for it to work. I have the voice recognition program Dragon Naturally Speaking. I want to know if I can use it with my Remote Control Base software. Our Remote Control Base Software does not know how to use Dragon Naturally Speaking. If you do download the Microsoft Speech SDK, you can turn it off for system voice commands and use it only in Remote Control Base if you want. It is completely configurable from the control panel. You can also uninstall it if you want. First you need Remote Control Base Software 3.02 or higher, which you can download from our web site. Then you need to connect to someone with the Buddy List and then click the pencil button to open the text chat window. Of course the person on the other end has to accept your connection first. Version 3.4 has message boards so people can leave you messages with pictures from your webcam when you are not available to answer. With versions up to Remote Control Base 3.02 you can't specify numeric values for named viewpoint pan and tilt positions. You can only select from the grid. We are working on a new applet that will let you specify pan/tilt/zoom/duration/etc. for each viewpoint so we are not putting more work into this interface. I mount my Remote Control Base to the ceiling in my office, upside-down. Of course, this totally reverses the controls (up with down, right with left). Do you think maybe you could include an option to reconfigure what each arrow represents when a user clicks on it? Thanks! In versions 3.4 and above, if you have a QuickCam Pro 3000 or 4000 you can use the video settings to mirror horizontally or vertically and we automatically flip the directions of the arrows. If you have a different type camera, what you need to do is go to the Tuner and select 'specify field of view' under 'Display & Camera'. Make the FOV angles negative and press 'Enter FOV angles'. Then to save those as Startup settings, Click the 'Startup' link at the top left and press the button marked 'Save Current values as Startup values'. That should do the trick for you. What are the motion detection features for the remote control base? How do I activate the motion detection tracking feature? To activate the new motion tracking feature, click and hold the [Track] button in the software program, and a menu should appear. Select the [Motion] option and the menu should disappear. If you wish to double check if the motion option is enabled, click and hold on the [Track] and the menu should appear again. The option [Motion] should now have a * beside it, which signifies that it has been selected. How do I change the sensitivity of the motion detection tracking feature? Once the motion detection feature is enabled, on the display screen there should be a strike-through bar with a boxed number at the end of it. This represents the current motion sensitivity. To make the motion sensor more sensitive, click and hold the boxed number and move it left of its original position. If you wish to make it less sensitive, click and hold the boxed number and move it towards the right of its original position. How can I enable and change the Motion Detection frame rate setting? Once in the software program, open the tool panel and look for the header [Tracking] and select the first icon which looks like a target box. A window titled [TrackerCam: Surveillance and viewpoint settings] will appear. To enable the feature, click the box on the left of the [Capture motion videos at frame rate(1-30):]. To adjust the frame rate at which it captures at, put in a numeric number between 1-30 in the box to the left of [frames/second]. The time can be adjusted according to your wishes (in the 24H format) or you can set it to record all day by checking the box to the left of [All day]. How can I playback my motion detection surveillance video? In the tool panel of the software Program, there is a heading labeled [Tracking]. Under that, click the first icon (of a target box). A window titled [TrackerCam: Surveillance and viewpoint settings] will appear. Select the [Playback] tab and click on [Surveillance viewer]. Click on browse and select the file you wish to view and then click on show once you are done to view the specified file. How can I set Windows to automatically associate the .image and .list files with the Surveillance Viewer? In the tool panel of the software program, select first icon (of the Target box) and a window titled [TrackerCam: Surveillance and Viewpoint settings] will appear. Select the play back tab and you should see the option boxes to all the association of the .list and .image files with the Surveillance viewer. IMPORTANT: If running our remote control base with its Logitech QuickCam Pro 4000 it should work if your computer is running Windows XP. But you need the latest drivers from Logitech. Also in our Multi-Cam/CamPanel each Logitech has the same name. You will need to plug in the first camera, Add a Camera in Multi-Cam/CamPanel, use that camera, then plug in a second camera, click Add Camera in Multi-Cam/CamPanel, use the new one, etc. Otherwise you can't distinguish one from the other. Is there an SDK for Remote Control Base? Both have source code for basic pan/tilt. There are many other commands. Expect about five to ten working days for our regular standard ground shipping to North America. Outside North America expect 10 to 20 working days to receive your Remote Control Base. Express shipping is overnight in North America and about three days outside North America. Express shipping is a surcharge on regular shipping that you may specify when you order your Remote Control Base system. Does the shipper require my signature? I am having it shipped to my home, but I won't be there. Yes, UPS needs an adult signature. If they reach your door and you are not there, they will call you to reschedule delivery. How long will my Remote Control Base last? The Remote Control Base's MTBF (mean-time between failures) is 2.6 million cycles, where a cycle is a 120 degree rotation. The lifetime of your remote control base will depend on how much you move it. We provide a 1-year repair or replacement warranty since we don't expect most people to use 2.6 million cycles. I am interested in the bundle but have not been always been happy with the quality of Logitech cameras. Do you have any kind of money back guarantee if I am not satisfied with the quality of the picture? Can I put a Camcorder on my Remote Control Base? Important: Your regular Remote Control Base will hold a webcam of up to 1/2 pound. 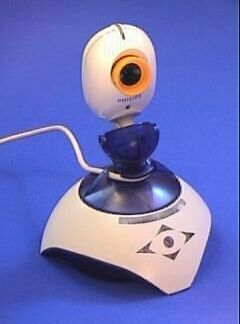 It is designed for webcams rather than camcorders or still cameras. If you mount a camera over 1/2 pound, you will void the warranty. Can I use an additional microphone? Yes, you can input sound via an additional microphone. Does your system hook up to cameras via RCA or BNC jacks? Our software works with cameras that use BNC or RCA jacks. They are typically connected to the PC with a capture card like the Hauppauge WinTV-GO for about $50. We support multiple cards in one PC. Most existing security cameras are of this type and are still useful. Their advantage is that they can be placed very far from the computer and connected with COAX cable. The brand new 260x zoom and auto focus digital camera we're now testing is of this type. If you are going a further distance than 5-8 feet, then you need to extend the video signal by using one of the following: USB Extenders, our long distance systems for less than 3/4 pound or our long distance systems for over 3/4 pound. Programs Files; Eagletron; Trackercam; HTTPRoot; Remote: index.php (1 place) and NewColsole.php (2 places); dummy.php3 (2 places). How do I insert the video into my own webpage? A: Creates a clickable LINK to put in a webpage and/or email. Steps 1-4 below. This will allow you to view your own webcam from your own website or directly from a link in an email. B: Shows you how to list your webcam on our website (gets you extra viewers). 14. type in your keyword in the search box, and your camera should be listed. Below is the Java Script code to insert a webcam video into a webpage of your own. DO YOU want to see webpages that are branded like a website, or two cams on a single page? Where are the recorded videos stored? Ones you get when you goto the Tuner> surveillance - capture stills> ? Tuner> Surveillance - Capture Stills (Click the link showing up) and log on by pressing the Surveillance playback button to view or erase saved surveillance pictures. Only users with maximum privileges can access the pictures. Copyright © 2012 www.nannycam.net and www.321cam.com.